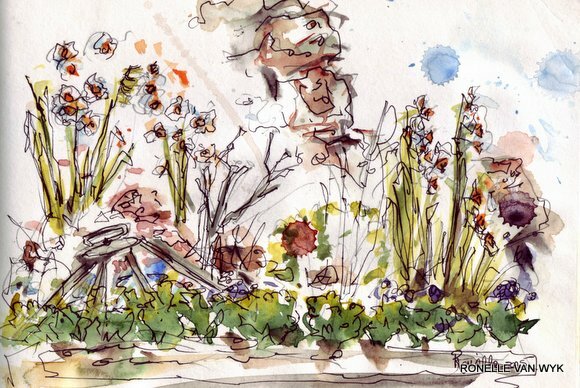 Sketches from Beaulieu and Les Jardins Marquessac. My artist friend Sarah visited and we visited les jardins Marquessac.I am totally inspired to finish my garden here at Coin Perdu, not to mention painting! I worked in different sketchbooks and I am considering going back to Moleskine, all three sizes. ..a sketch done in Beaulieu while waiting for my physiotherapy appointment..
..a sketch of a street in Beaulieu..
..the marketplace in St Céré..
Resketch the gargoyle and fountain. I wasn’t satisfied with the gargoyle sketch 2 posts ago and even leaving it to the art fairy didn’t help. In fact the more I looked at it, the worse it got. So today I decided to redo it. I am still not in heaven about the sketch, but at least it is a bit better and I am tired of that spot in the garden. I suppose you can’t win all the time.And now I have to move on. This morning it rained. then the rain made way for the sun. We decided some grilled fish would be great for lunch. While mon chéri grilled our daurade over the coals, I lazily, splashed watercolor and squiggled pen lines in two Stilman &Birn sketchbooks. 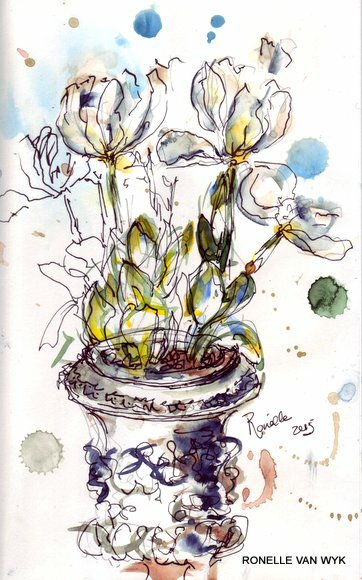 White tulips in an urn and white daffodils among boxwoods…simple scenes turned into messy washes…how I love it..! ..Sketching in the garden 1..
.Sketching in the garden 2..
Les muguets de 1er Mai..